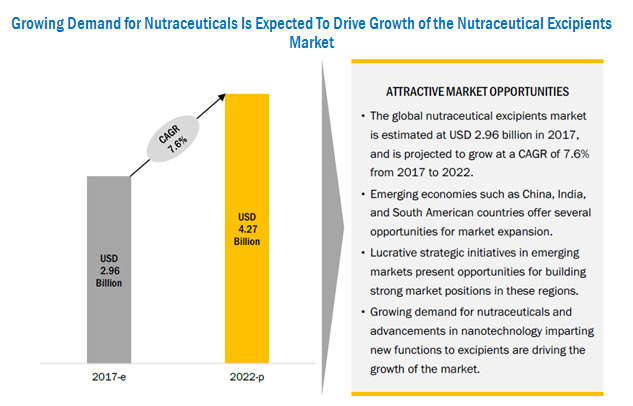 [138 Pages Report] The nutraceutical excipients market was valued at USD 2.76 Billion in 2016; this is projected to grow at a CAGR of 7.6%, to reach USD 4.27 Billion by 2022. The basic objective of the report is to define, segment, and project the global market size for nutraceutical excipients on the basis of functionality, form, end product, and region. It also helps to understand the structure of the market for nutraceutical excipients by identifying its various segments. The other objectives include analyzing the opportunities in the market for stakeholders and providing a competitive landscape of market trends, analyzing the macro- and micro-indicators of this market to provide factor analysis, and to project the size of the market for nutraceutical excipients. This report includes estimations of the market size in terms of value (USD million. 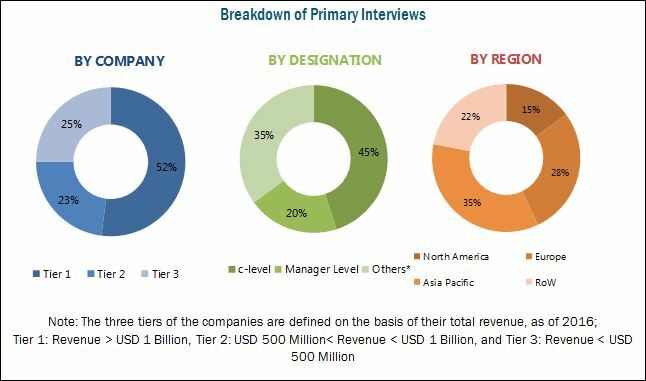 Both, top-down and bottom-up approaches have been used to estimate and validate the size of the global nutraceutical excipients market and to estimate the size of various other dependent submarkets in the overall market. The key players in the market have been identified through secondary research, some of the sources are press releases, paid databases such as Factiva and Bloomberg, annual reports, and financial journals; their market shares in the respective regions have also been determined through primary and secondary research processes. All percentage shares, splits, and breakdowns have been determined using secondary sources and verified through primary sources. The figure below shows the breakdown of profiles of industry experts that participated in the primary discussions. The key players that are profiled in the report include Kerry (Ireland), ABF (UK), DuPont (US), Ingredion (US), Sensient (US), Roquette Frères (France), Meggle (Germany), Hilmar Ingredients (US), JRS Pharma (Germany), Innophos (US), Cargill (US), and IMCD (Netherlands). The global nutraceutical excipients market is estimated to be valued at USD 2.96 Billion in 2017; it is projected to grow at a CAGR of 7.6%, to reach USD 4.27 Billion by 2022. Factors such as advances in nanotechnology used to impart new functions to excipients and a wide range of applications in the food & beverage industry are driving their market. 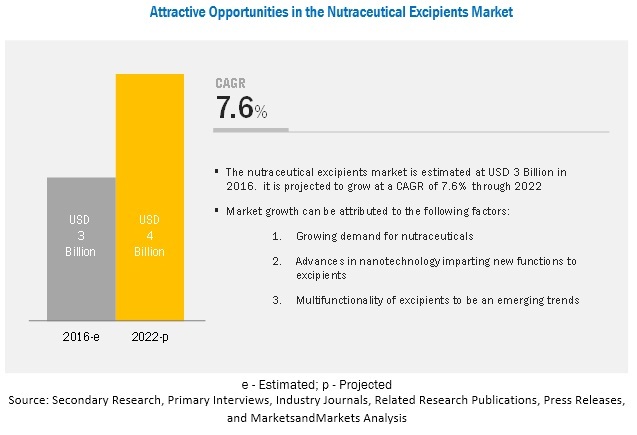 On the basis of end product, the nutraceutical excipients market is segmented into prebiotics, probiotics, proteins & amino acids, vitamins, minerals, and omega-3 fatty acids. Proteins & amino acids accounted for the largest share, followed by the omega-3 fatty acids, in 2016. Excipients facilitate stabilization of proteins and protect them from undesirable chemical reactions. On the basis of functionality, the nutraceutical excipients market is segmented into binders, lubricants, fillers, disintegrants, coating agents, and flavoring agents. Fillers & diluents accounted for the largest market share in 2016. The easy availability to and wide acceptance of fillers & diluents among nutraceutical product manufacturers has accelerated the growth of this segment. On the basis of form, dry segment accounted for a larger market share in 2016, followed by liquid segment. Excellent flowability of the excipient powder is an essential characteristic required for it to function as a filler, diluent, or a binder in nutraceutical products such as in oral dosage formulations (ODT). The popularity of the dry form can be attributed to its cost-effectiveness and convenience in multiple applications. The Asia Pacific region is projected to be the fastest-growing market for nutraceutical excipients, at a projected CAGR of 9.0% from 2017 to 2022; it accounted for a market share of 26.4% in 2016. With busy lifestyles and increase in disposable incomes, the demand for fortified nutritional food & beverage products is growing in the region. The application of excipients is estimated to increase at a higher rate due to the demand from the nutraceutical industry. The major restraining factor for the nutraceutical excipients market is restraining R&D investments. The cost of proving the effectiveness of an excipient through clinical trials is also relatively expensive and can be a major hindrance to the development of novel excipients in the market. Many multinational excipient manufacturers have made minimal investments in R&D due to several challenges for excipients in the past few years, except in the area of specialty excipients. Companies such as Kerry (Ireland), ABF (UK), DuPont (US), Ingredion (US), and Sensient (US), and Roquette Frères (France) have acquired leading market positions through the provision of an expansion and broad product portfolio, along with a focus on diverse end-user segments.